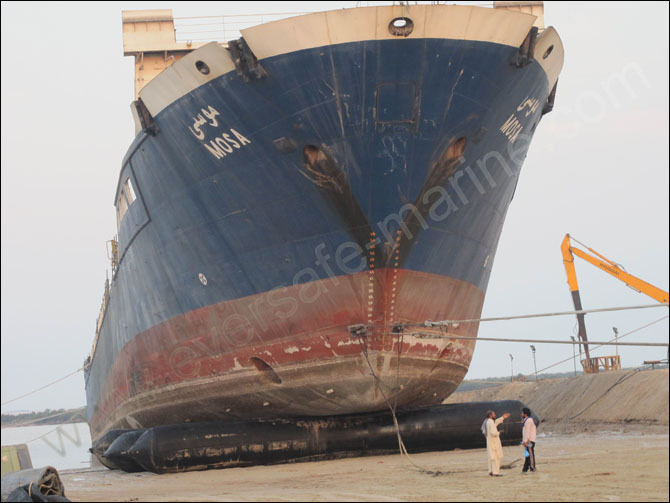 Eversafe Marine successfully completed one Ro-ro cargo ship docking project with balloons (marine airbags) in Abu Dhabi U.A.E on 14th November 2012. Eversafe Marine was invited to provide service pack for this project including design, calculation and operation supervision. And the 16 m long by 2m diameters balloons deployed in this project are supplied by our group company, Evergreen Maritime. 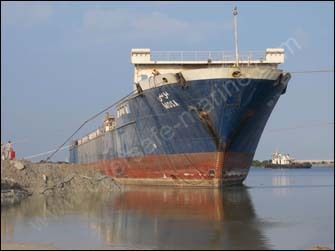 Vessel need to be beached on client’s shipyard for repair. 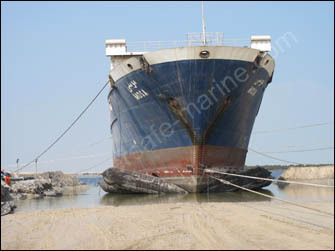 Marine airbags and winch are the main equipments to complete the hauling out operation. After vessel is pulled up to the ramp, people will use 1.4 m high blocks to support vessel. Then vessel will be shifted to repair location by SPMT. 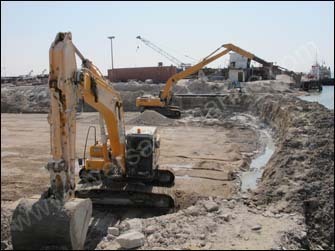 The docking ramp is composed of compacted natural sand and casting rocks. From the start of ramp there are 40 m long by 20 m wide area covered by steel plates. The tide change of local sea is little, only 1 m difference with highest and lowest tide. Airbag ship docking technique takes advantage of the tide change to insert balloons and pulling ship out of water. Little tide change caused this docking operation to be complicated and difficult. 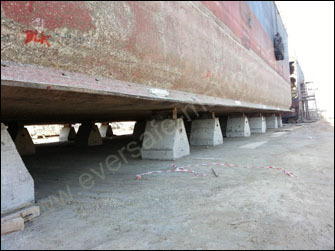 Due to SPMT shift demand the Ro-ro ship must be lifted to be 1.4 m high by air bags. That is also the difficulty of this project. The technical team from Eversafe Marine arrived at shipyard on 29th October. It took people about 7 days to make the preparation works ready. In high tide time of 6th Nov. the ship” MOSA” was pulled up to ramp for 30 meters. In the late night when water dropped down, the first six balloons were inserted underneath the ship. The next day (7th Nov) people pulled ship forward for another 30 meters. Until 9th Nov all balloons were right positioned according to the plan. At that time the ship got balance by supporting balloons then the pulling job came to be easy. 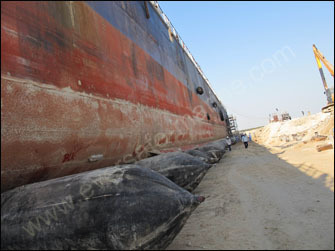 On 11th Nov. the ship was fully landed on the ramp. People began to lift the vessel from aft part to place support blocks. The flexibility of marine airbags helped a lot for the block position work. People can adjust balloons pressures to lift up and low down ship easily to enable block placing and vessel level job. 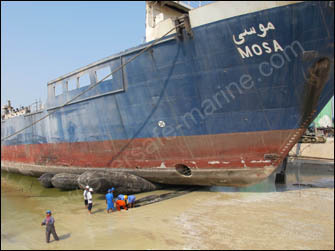 On 14th Nov ship “Mosa” sit steadily on all support concrete blocks. Eversafe team conquered lots of difficulties to complete this job, not only practical conditions but also mental fatigue. We thank our client for their full support and thank our personnel especially, they are always tenacious and fearless to fight with hardness.